Oracle positions the search engine as one that takes extra steps to avoid getting companies in trouble with data privacy laws and regulations. The search engine is designed to deliver results based on an employee's function and privilege level within a company. Oracle has taken the plunge into enterprise search, an area that has businesses trying to strike a balance between improved information access and fears of employees viewing and disclosing sensitive data. 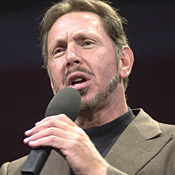 While unveiling Oracle Secure Search 10g last week at OpenWorld Tokyo 2006, CEO Larry Ellison cited it as among the company's most important product introductions in years. Oracle touts the offering's ability to ferret out information from the data corners of a company, including internal E-mail, instant messages, mainframe files, corporate portals, and application databases. And it's designed to present data, such as purchase orders, in context of its original application. Can Ellison sell search with security? Oracle positions the search engine as taking steps to avoid getting companies in trouble with data privacy laws and regulations. The search engine is designed to deliver results based on an employee's function and privilege level within a company, helping businesses meet compliance regulations that require them to maintain tight controls over who can access certain types of information. The company best known for search technology was hit with privacy concerns last month, when Gartner warned businesses about a feature in the consumer version of Google Desktop 3 that lets users search their local files from any computer with Google Desktop 3 installed if that computer is logged on to a user's Google account. The service requires Google to keep indexed copies of files on its servers, essentially moving customers' information off-site. Google addressed some of those worries with Desktop 3 for the Enterprise, which has controls that let IT administrators turn off the controversial feature. Google Desktop 3's capability to search desktop files is hardly comparable to the broad data search system that Oracle is offering or what IBM offers with WebSphere Information Integrator, OmniFind Edition. Google is trying to match those capabilities by partnering with BearingPoint and a number of software vendors, looking for ways to expand the business uses of Google search tools. Part of Oracle's pitch is to show companies already using its search engine without fears of sensitive data exposure, citing consulting company A.T. Kearney and the Austrian National Bank as early customers. And it may try to beat IBM on price: It lists Secure Search 10G at $30,000 per CPU, while WebSphere Information Integrator goes for $75,000 per CPU. Oracle's search engine is slated for general availability May 31. Compliance fears or not, more options for search engines that can sift through internal company information are headed for the desktop. Neil Holloway, Microsoft's European president, says the company will produce its own search engine that will best Google's in the first half of this year, though he offers no other details. There are established players in enterprise search. Fast Search & Transfer has 3,500 business clients for its search engine, including AT&T, Cardinal Health, Fidelity Investments, LexisNexis, and Reed Elsevier. Autonomy's technology, which uses complex pattern matching to search unstructured data and pull related information together, is a particularly effective approach to companywide search. With pattern searching, more words, phrases, and sentences that are related can be sought and pulled together into results. It uses neural networking and can detect related sequences of data that a search engine based on keywords can't. Autonomy lists Dow Chemical, General Motors, NASA, and the Department of Homeland Security as its customers. Oracle's search engine also can be integrated with existing directories, such as Microsoft Active Directory, and identity management systems for companies that require a high level of data-access control. While Secure Search 10G can evaluate a user's data-access credentials and the sensitivity of certain types of information, some identity management systems can place detailed restrictions, such as the time of day when a specific employee can access certain information.